With the flexibility of diesel or equivalent spark-ignited models, Kubota engines help your airport run like clockwork. Keep it all in motion with renowned ability to endure changing weather and heavy loads. Maximize uptime with their reliability and easy maintenance. Take a look at our offerings, and get face-to-face with the Kubota team at inter airport Europe! 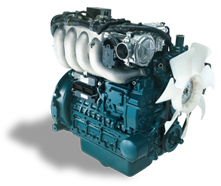 Request information about Kubota engines for your GSE. I agree to receive emails from Kubota Engine America and understand that I may unsubscribe at any time by clicking the link at the bottom of an email. If you have any questions please send your inquiry to kea_g.contactus@kubota.com.